Voting and violence in Abyei, the heart of Sudan. Abyei, Sudan—On October 19, Bulbul Deng was detained at a government checkpoint as he traveled by bus back from a medical appointment in Khartoum to his home in Abyei, a region situated in the heart of Sudan. At the checkpoint, Deng says the men onboard were forced to lie face-down on the ground, while the Sudanese government soldiers, carrying wooden sticks and AK-47s, asked who among them had fought against the government in violence that destroyed part of Abyei in 2008. Though he told them he did not fight against the government, Deng and a couple more men of military age were detained while the women, children, and other men were eventually let through. Deng says he was beaten with a stick (a recent scar on his chest is visible) and that his hands and feet were tied. “One of the officers said that I was to be taken to the bush to be killed,” he recalls. But he and the other young men with him were released about an hour later—and told to deliver a warning to others who want to travel to Abyei. “[The officer] said, ‘You go and tell the people in Abyei that, when your people come here, we will kill you,’” Deng says. “[People] going to any other directions, they don’t bother. Only the ones who are going to Abyei,” Deng added. Abyei is a fertile, 4,000-square-mile area that lies between the north and south of Sudan. 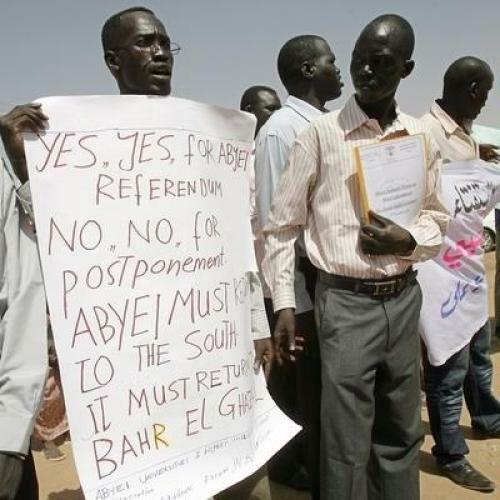 On January 9, Abyei’s residents will vote in a referendum to decide which region they want to be a part of. Their vote will occur simultaneously with the more high-profile referendum on whether Sudanese in the south want independence from the north. Both referenda were mandated by a 2005 peace agreement that ended the 22-year war between the Sudanese government, based in the predominantly Muslim north, and rebels in the south. During negotiations, the parties could not agree on whether Abyei, whose oil then accounted for 25 percent of Sudan’s annual production, belonged to the north or the south, so they scheduled a separate vote. Already, ethnic divisions are threatening the viability of the January 9 vote. Abyei is inhabited year-round by Ngok Dinka like Bulbul Deng, but Misseriya nomads migrate there each year from the north during the harsh dry season to let their cattle graze near the River Kiir (or Bahr el-Arab, in Arabic).During the long war, the Ngok Dinka were affiliated with the southern rebels, while many of the Misseriya were recruited as proxy militia for the Sudanese government. Today, authorities in Khartoum and their counterparts in the south have yet to agree on what constitutes, for voting purposes, a “resident” of Abyei. If only the Ngok Dinka get to vote, Abyei will almost certainly go to the south—a prospect the Sudanese government wants to prevent and the Misseriya fear could cost them access to the grazing land they need to survive. If the Misseriya also get to vote, Abyei just might go to the north—an event the Ngok Dinka worry would leave them under the rule of President Omar Al Bashir, whose government might seize their land. Their southern kin, meanwhile, could be living in a new, independent nation. To date, there have been no reports of Ngok Dinka harassing the Misseriya—but this may only be because the nomads have yet to attempt to enter Abyei this year. After I spoke to him, Kuol told Bloomberg news that his people will use force to prevent the Misseriya from making their seasonal migration into Abyei, which normally takes place in November, unless the group accepts that it does not have the right to vote. Abyei holds the unenviable title of being the location where the most serious breach of the 2005 peace agreement thus far has occurred. In 2008, fighting broke out between northern and southern soldiers in the area’s largest town, which shares its name with the region. According to Human Rights Watch, Brigade 31 of the Sudanese Armed Forces and their allied militia razed the local market and destroyed over half of the homes in Abyei. Many civilians were killed, and almost all of the town’s remaining population—some 60,000 people—fled. In January, because those eligible to vote in the Abyei referendum will only be able to cast their ballots in Abyei itself, regional administrator Deng Arop Kuol estimates that 36,000 displaced Ngok Dinka will try to return from Khartoum, where they went to escape the 2008 violence. Most of them will be using the same road, from Khartoum through Kadugli and down to Abyei, that Bulbul Deng was detained on. Deng says that the U.N. should be patrolling at checkpoints like the one where he was detained; “They should see people when they are coming and bring them through safely.” However, Deng’s plea seems unlikely to be met: The U.N. official I spoke to said the Sudanese government has so far denied officials from the international body permission to travel north of Abyei town to the areas where the reports are coming from. As long as uncertainty remains over who gets to vote in the referendum, both sides have an incentive to reduce the numbers of the opposing group who can enter the region—leading some to suggest that the referendum might need to be abandoned altogether. "Given that there is not agreement between north and south on the details of that referendum, if they are able to arrive at a different course of action, that is up to them,” U.S. State Department spokesperson P.J. Crowley said last week. One alternative being proposed by southern Sudanese politicians is for the north to annex Abyei by decree to the south; in exchange, the south would give the north an increased share in oil revenues from fields that, if the independence referendum on January 9 passes, will belong to the new southern nation. Meanwhile, those currently living in Abyei fear that failure to find a political solution could lead to a violent attempt to dictate the region’s future. What’s more, even if the issue of voter eligibility is resolved, it probably wouldn’t take all of the heat out of the Abyei question: Ethnic rifts would still exist—and one side or the other wouldn’t be happy with the definition of an Abyei resident. Bulbul Deng, who fled Abyei in 2008 when his home was burned to the ground but returned last year, says this time, he would stay to fight. “If we run away again, we will lose the land. Rebecca Hamilton is a fellow at the New America Foundation and author of the forthcoming book, Fighting for Darfur. This article was supported by funding from the Pulitzer Center on Crisis Reporting.